2017: Tuesdays and Thursdays, January 10, 12, 17, 19 in Fine Arts Center 444. 1:00 to 4:00 PM each day. but not required (lab mac & windows computers are available). Taught by Eric Martz* and Jeffrey Kane. Goals: This course will prepare students to understand and incorporate 3D macromolecular structure into their research and teaching. The principles of protein structure will be reviewed, including noncovalent bonds. Structural bioinformatics and genomics will be introduced. Students will learn what percentage of proteins have known 3D structures, and the importance of crystallographic models compared to homology models, or theoretical models. 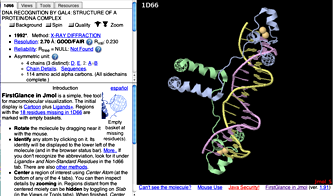 Using laptop computers, students will learn how to find 3D protein molecular models for proteins of interest, or how to construct homology models, and how to use the FirstGlance in Jmol 3D visualization software (adopted by the journal Nature) to investigate key structural features. Protein structure will be related to function, evolutionary conservation and multiple-sequence alignments, and drug design. Specific oligomers will be constructed and visualized. Students will learn how to prepare customized publication-quality molecular images and animations for Powerpoint slides. Each student will prepare a report, using Powerpoint slides to capture the concepts and skills they have learned. All the software is web browser-based, easy to use, works on Windows or Mac OS X, requires no installation, is free and open-source, and is expected to be available for years to come. If you brought your own laptop, you are welcome use it. (iPads will be too slow.) You may use Mac OS X or Windows, whichever you prefer. The software works the same in both. In the Firefox (or Safari) browser, go to our syllabus: Workshops.MolviZ.Org. 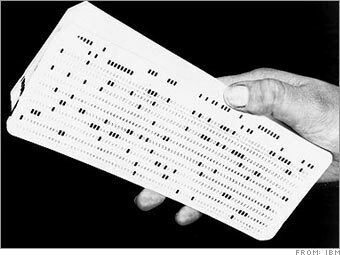 Now you can see this document in your browser. Go to Atlas.MolviZ.Org. Nikhil Malvankar (Physics) took this workshop in 2012. Published his homology model in 2015. The Protein Data Bank (PDB) -- World Wide: USA:RCSB -- Japan:PDBj -- Europe:PDBe. All 3 have the same data. 1pgb a small protein domain, one chain. 2hhd four protein chains with ligands. Well developed by 9 authors: Avian Influenza Neuraminidase, Tamiflu and Relenza. Pages in Spanish, Chinese, Russian, Arabic, Japanese, Turkish, etc. An electron density map at 2.5 Å resolution. See also Quality Assessment for Molecular Models, R value and especially Free R.
II. Obtaining models for molecules of interest. Each student: please find a 3D model of a molecule related to your research or interests. You will use the model that you select for the rest of the class, and for your Powerpoint report. Browsing: If you can't find a model for your protein, or you don't have a molecule in mind, look at one of these sites and pick one. Complete questions 1-3 now: Questions for your slides. III. Review of Protein Chemistry and Structure. Gly (turns), Pro (turns, helix breaking: 245-277 in 1f88). Typical hydrogen bond within a protein: hydrogen donor atom is covalently bonded to hydrogen; acceptor atom is not. In proteins, donor-acceptor distance can be 2.5 to 2.5 Å.
IV. FirstGlance in Jmol for exploring any macromolecule. FirstGlance in Jmol (Part I). To start FirstGlance, google "firstglance" (no space), or go to FirstGlance.Jmol.Org. 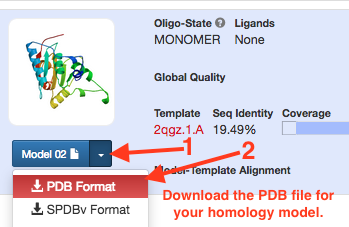 Enter the PDB code, or upload your homology model. Salt bridges in Charge View. (Red sidechain (-) touching blue sidechain (+)). Continue preparing slides to answer the Powerpoint Questions. OPTIONAL: If you want a research grade result, check "Let me select the sequences for the analysis manually out of BLAST results", and see Limiting ConSurf Analysis to Proteins of a Single Function. Leave all other parameters at their pre-set defaults. Multiple sequence alignments reveal conservation: MSA for 4ENL in black and white. Detail of MSA with color. ConSurf does a much more sophisticated job of calculating evolutionary conservation scores than this simple example! ConSurf Mechanism. (Details of Mechanism). Challenge: how can protein charge be changed in seconds, without changing the pH? . Follows the instructions under Charge.. in the Views tab. a larger view and explanation. Animate customized molecular scenes easily with Polyview-3D. Animations are most easily saved from FirstGlance, but you are limited to the "canned" color schemes and renderings that it offers. 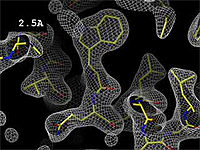 Proteopedia.Org has molecular scene authoring tools: you use checkboxes and forms to customize the scene, and it is immediately online to share. "Export Animated Image" is under development but does not work well yet. Polyview-3D also allows customization of colors and renderings from forms and checkboxes. Its output is a high-quality animation (rendered with PyMOL) or publication-quality image. Accepts PDB files obtained from ConSurf to color your figures or slides by evolutionary conservation. Under Advanced Structure Annotation check "Functional regions from ConSurf" and follow the displayed instructions. emartz AT microbio DOT umass DOT edu. Probably we will not have time in class to spend on these resources. Links are provided here in case you are interested to look at these later. FirstGlance in Jmol is used in Nature (3D buttons) and other journals. Note that Proteopedia is easier than "Jmolizing": see Interactive 3D Complements in Proteopedia (similar to supplementary materials). Lac repressor bending the DNA operon. If this image is not moving, reload the page. 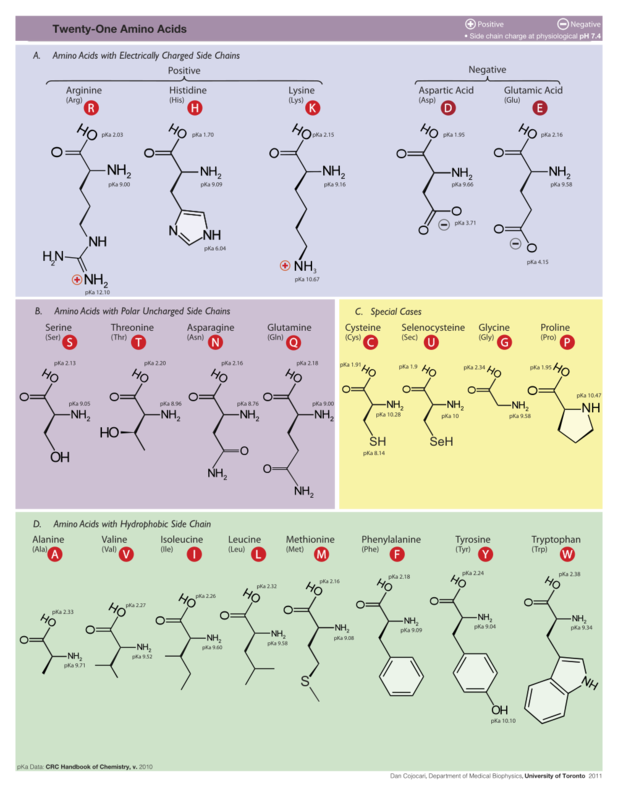 BioMolecular Explorer 3D (for students ages 15-19). Building a web page that shows your favorite molecules for research or teaching. Proteopedia is by far the easiest. Your text and molecular scenes can be protected and are online and searchable immediately! Making hyperlinks that show your molecules in FirstGlance in Jmol. Molvis-list, jmol-users, PDB-list, etc. email discussions available from molvisindex.org.